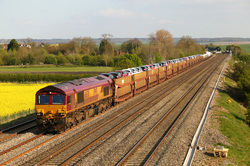 Cholsey is located a few miles to the east of Didcot on the Great Western Mainline between Bristol and London Paddington. 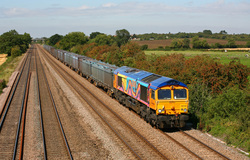 The bridge at Cholsey Manor Farm provides good views of the four track mainline heading to and from London. 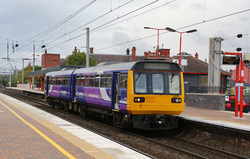 The area is about the undergo a huge transformation with the announcement of the overhead electrification. The purpose of this visit was to record the unspoilt vista of the location before contractors arrive to install foundations, gantries and wires throughout. On the 15th February we made a visit to the area to photograph some of the current workings which are possible to record. We first visited Bishton (near Magor), continuing to Margam Yard/ Port Talbot Steelworks, and then back to Coed Kernow, finishing the trip back at Pilning on the English side of the Severn Tunnel. 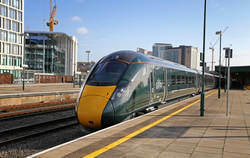 The Freedom of Severn and Solent offers unlimited travel on any train operated by First Great Western, Cross Country, South West Trains and Arriva Trains Wales after 9am on the days of use. It's valid to the north of Taunton as far as Cardiff and Great Malvern. 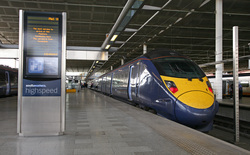 Swindon is the most easterly station which may be visited, and it's also valid to Eastleigh, Southampton & Portsmouth Harbour. The 3 in 7 Rover costs £45 and is exceptionally good value. 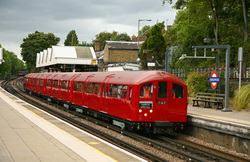 (Further details can be found on the National Rail Website and a Map is also available). 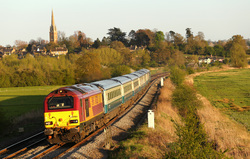 The ticket offers the freedom to travel at leisure around the South West and visit many locations within one day. 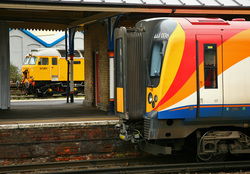 Eastliegh is located to the east of Southampton and plays a major part to rail operations in the south of England. 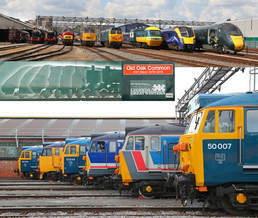 Eastleigh Works provides a sub contract maintenance/ overhaul/ storage facility for any rail operator via Arlington Fleet Services. 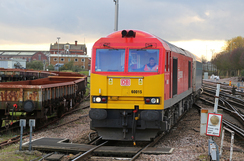 Eastleigh Yard is used by Network Rail as a major ballast processing and loading facility and also provides a large engineers base for rail based operations in the south of the UK. 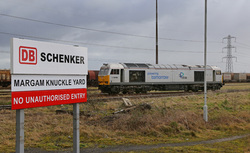 The station also provides crew facilities for GBRf, DB Schenker and Freightliner. 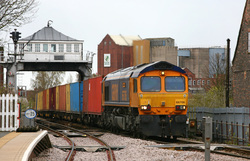 Most Freightliner services stop at Eastleigh in each direction for crew changes. 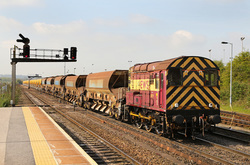 Couple these heavy freight operations to the regular services operated by South West Trains, Eastleigh is an exceptionally busy rail centre which is currently experiencing a huge number of trains operating through the small town each day. Unfortunately we are not able to order some nice sunny Autumn weather for the visit, as despite a good forecast, the wet day took longer to blow through than expected. 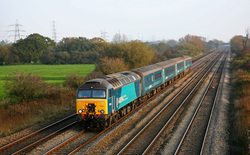 Below is a selection of images taken during a visit on the 26th October 2012. While on route to the Great Central Railway Diesel Gala on Friday 7th September, we decided to make a day of mainline photography as we traveled north to Loughborough for the weekend. We didn't plan the locations until our first service station stop on the M42, as the weather was looking favorable for all three days of our Midlands visit we decided the first call was Washwood Heath in Birmingham. 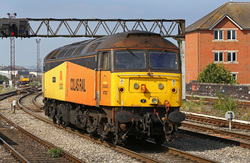 We spent the mid morning at this popular location to capture the newly released Class 56 from Colas. In the afternoon traffic flows indicated that Cossington (Midland Mainline) would provide some variety of freight / passenger services into the early evening. Below is a selection of images from the day. 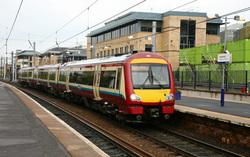 April 2012 provided a week long visit to Scotland using the ‘Freedom of Scotland Rover’ to get around. Although the week was based around rail travel, to make the most of the ticket there were opportunities to take photographs along the way. Our base for the week was Haymarket which gave us the opportunity to visit some outposts in the Scottish Highlands such as Aberdeen, Inverness, and Fort William without having to overnight at another location. Our route up was with First Great Western to London Paddington before traveling First Class with East Coast from Kings Cross to Edinburgh. The weather during the week wasn’t the best, but with snow still evident (and falling) in the highlands the scenery was stunning. A further surprise was the Glasgow suburbs which proved to be an real eye opener with some superb sights to be witnessed. The Lincolnshire and Yorkshire ‘Road Trip’ was planned as part of a hasty replacement for a trip to America in 2012. Unfortunately we had to postpone this overseas trip, but replaced it with two trips in April to compensate for not being able to go abroad. We planned to head North (via a stop off at Ashchurch (near Cheltenham) and Portway (in the Midlands) then heading on to Barnetby (in Lincolnshire), before heading to York where we would cover the various maze of freight lines connecting to Drax, Eggborough, and Ferrybridge power stations. We returned south via Clay Cross (near Chesterfield). The 25th January saw a trip onto Southern territory for a visit to Ford Station on the South Coast. Situated between Southampton and Brighton (just to the North of Littlehampton) Ford Station also provides quick and easy access to the popular Guagemaster Model Shop. Things didn't go to plan after we planned a meet up at Southmapton with a friend from Portland. A 80 year old lady drove her car off the road crossing at Brokenhurst Station causing major delays to train services to and from Weymouth/ Southmapton. 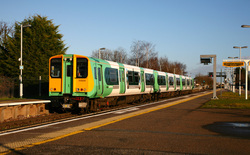 After a coach connection we were finally able to continue forward to Ford via Fareham with Southern Trains. The return trip from Ford also took in Littlehampton, Barnham and Portsmouth Harbour, before picking up our First Great Western service home.